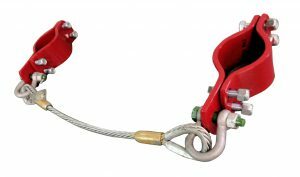 The Whip Stop hose safety restraint system is designed to significantly reduce the risk of injury caused by a high pressure hose blow-out failure. The magnitude of force caused by a large-diameter pressurized hose can cause fatal injury and be difficult to quickly restrain. Additionally, cleanup and downtime can be costly if hazardous chemicals are being conveyed. The whip stop safety restraint system, also known as a whip sock, will prevent blow back and hold a high pressure hose in check until pressure can be safely decreased. Whip Stop systems are capable of significantly higher pressure ratings than the standard whip-check or nylon hose safety restraint. Hobble clamps are available for a wide variety of pipe diameters and can be custom made to specifically meet your requirements. 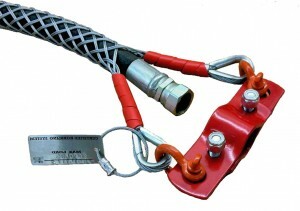 Shackles are available with bolt and cotter pin or carabiner option for hoses that are frequently disconnected. Whip Stop systems can also be connected directly to one another without a hobble clamp where two hoses are being joined. Ensure that the mounting point is capable of withstanding the significant force caused by a hose blow-out prior to mounting. For force calculations please contact us. MSHA 30 CFR § 56.13021. Except where automatic shutoff valves are used, safety chains or other suitable locking devices shall be used at connections to machines of high-pressure hose lines of 3/4-inch inside diameter or larger, and between high-pressure hose lines of 3/4-inch inside diameter or larger, where a connection failure would create a hazard. Pneumatic power tools shall be secured to the hose or whip by some positive means to prevent the tool from becoming accidentally disconnected.